Centred around enigmatic yet familiar imagery, drawn from the world of advertising and the technology, Wolfson regards his art as a largely intuitive response to the world around him. Blurring the distinction between the real and imagined, Real Violence, 2017 is a virtual reality film where spectators are implicated as witnesses to a context-less assault. The audience watches, without any ability to intervene, as one man (played by the artist) beats another to death with a baseball bat. Cars and pedestrians casually pass by the scene as users overhear a Hebrew Hanukkah prayer, resounding an antithetically jovial tone. Rather than focusing on virtual reality’s interactive properties, Wolfson explores the medium’s capacity to isolate and immerse. Typical experiences of violence seen in the news media or on Youtube are often taken for granted. 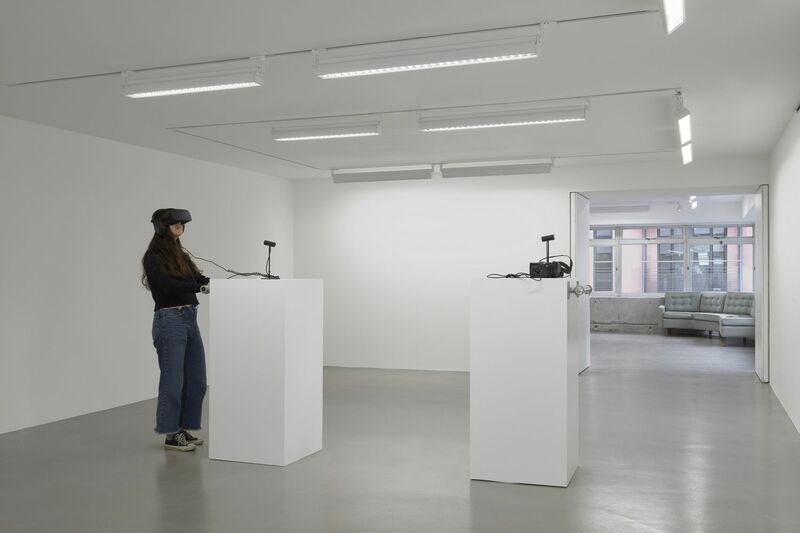 In this installation Wolfson forces the audience to confront their desensitization to real violence and the disempowerment that is inherent to a screen oriented perspective.